With the intention of researching British clothing manufacture since the beginning of the Industrial Revolution (yes I know, that small topic! ), I decided to go to Derbyshire in England for a few days. Numerous conversations with my Gran and two booked train tickets later (one for me and one for Gran), I was fascinated, excited and already overwhelmed. We went straight to the birth place of the two first water powered cotton spinning mills, Cromford Mill (1771)[ref]Cromford Mill Museum[/ref] in Cromford, and Masson Mill (1783)[ref]Masson Mill Museum[/ref] just down the road in Matlock Bath. Both factories, now World Heritage sites, were pioneered by The Father of the Factory System[ref]Not to be confused with The Father of the American Factory System, Samuel S Slater, born in nearby Belper, Derbyshire. 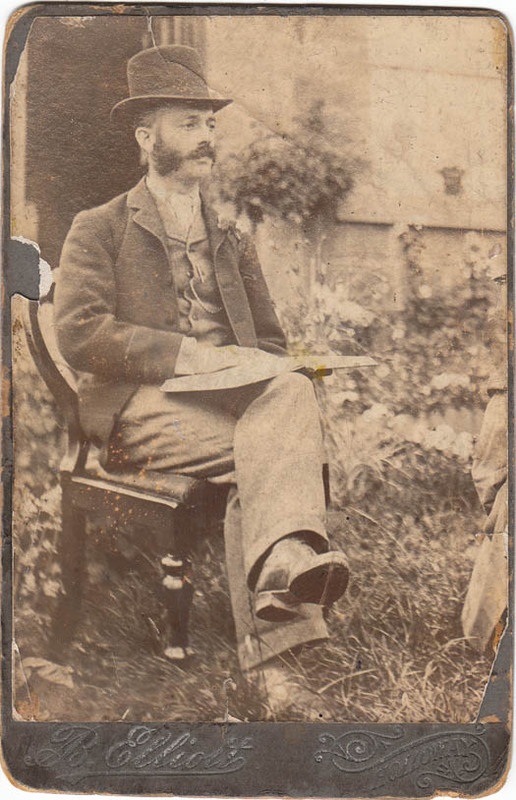 Slater had worked at Cromford Mill and deciding he wanted to cash in on the Industrial Revolution, ran off to America with his knowledge and factory experiences to start out on his own. Apparently, we (British people) didn’t like that, subsequently he became known, at least in Derbyshire, as Slater the Traitor! instead. [/ref], Sir Richard Arkwright (1732-1792). Arkwirght started out as an apprentice Barber and Wigmaker in Bolton, before developing a roller spinning machine in 1768. [ref]Said to have been in secret, with a man called John Kay[/ref] A year later he moved to Nottingham where he set up the first horse-powered spinning mill with partners. [ref]Jedediah Strutt and Samuel Need[/ref] They were later pushed out of Nottingham by the 19th century, against machine labour and self-policing textile machine destroyers, the Luddites! [ref]During the 1810s the Luddites smashed industrial textile machinery, set fire to factories and sent death threats to owners and supporters of the Industrial Revolution. They were against the introduction of industrial innovation because of already high levels of unemployment. [/ref] Arkwright subsequently relocated to Derbyshire and is now recognised as the pioneer of the factory system and amongst other bits of industrialist genius, inventor of the waterframe. The third mill in the area, opened thirteen yrs after Arkwright’s first, is the John Smedley Mill. [ref]John Smedley Ltd[/ref] Gran had grown up in the area so, with her help, I put things into perspective. I was surprised and interested to learn about this company, still in operation today almost 230 years on. Henry was Hosiery Warehouse Manager at Smedley’s in the latter half of the 1800s. A position Gran and I thought reasonably prestigious. We arranged to meet with Smedley’s Archivist, Jane Middleton-Smith, with whom we soon learned of the regimented hierarchy of managers within the factory and it was most likely Henry was at the lower end of the pecking order in a managerial sense. 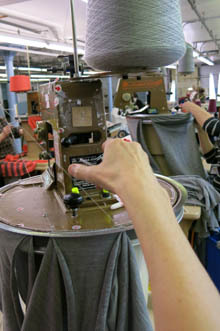 It was suggested online that Smedley’s are the longest running factory for clothing manufacture in the world. “Wow!” I thought. 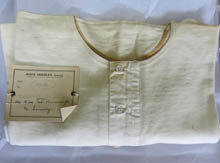 Jane was far more grounded, as a historian and archivist, she said she’d be quite nervous to state categorically yes, but she could say they are definitely one of the oldest, possibly the oldest continuous running clothing manufacturer in the world. Still, very impressive! “Nightmare in Smedley Street”, she read to me and laughed. 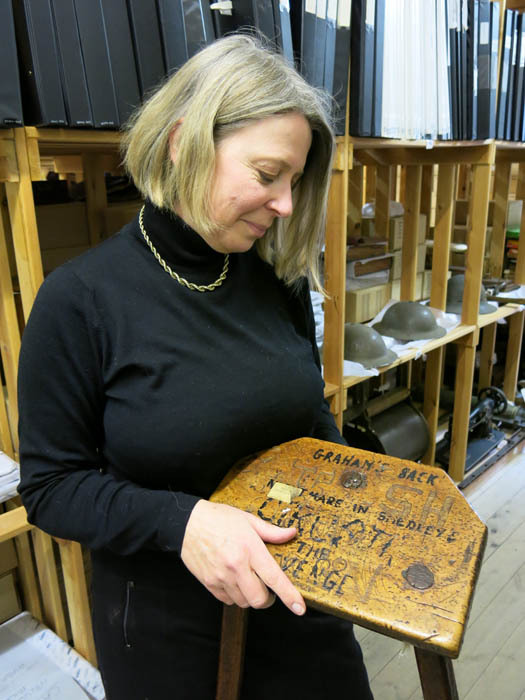 Reading from one of her favourite objects in the factory’s archive, a three-legged wooden stool covered in decades of carved graffiti, one of only a few now remaining from 100s. The finishes, the attention to detail on these garments was truly outstanding. I considered the quality of my own knitwear and it’s not good. 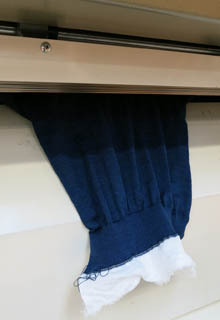 Apart from the moth holes, usually when I wear something woollen I’m all ‘Here’s one I shrunk earlier!’ I pretend that I’m making a deliberate ¾ length sleeve, cropped body statement, when actually I’m making the best of another washing machine incident. I don’t buy clothes from shops very often either, but when I do at least one button has made a fast get-away, before I’ve gotten home. I’ve very foolishly bought clothes with threads unravelling, and let’s not limit this to knitwear, convincing myself I’ll neaten them up, but I never do. It’s not necessarily about cheap or second-hand goods either, I have friends who work for high-end fashion brands who tell me their companies’ jumpers can bobble, colours fade and threads undo, depending on the factory they were made in for that collection. 3D knitting machine, Source: Address Publications[/ref]. I’d become more and more fascinated by Smedley’s ability to shift through time; two world wars, a depression and a recession, for starters, and still reinvent what are ultimately well made staples, surviving without compromise to the manufacture of the product and remaining in Briton too. 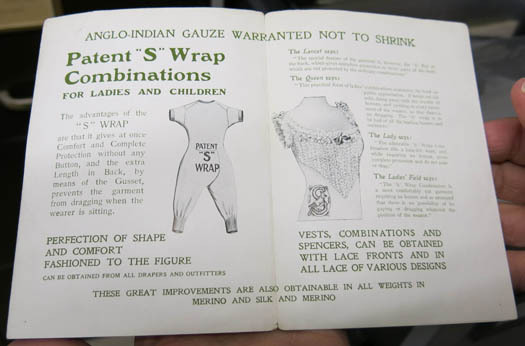 I was shown examples of Smedley’s as leaders in fine knitwear hoisery, like their patented S Wrap, an underwear knitted wrap type of flap for women and children’s underwear, before we had the luxury of the sewn in gusset today. It’s almost unheard of to have hung onto such skilled workers in this specialised field of manufacture, certainly on this scale in Briton. Collaborating with top fashion designers and designer brands, at least in part, must have enabled their survival. Collaborations with labels such as; Jeager, Agent Provocateur, Vivienne Westwood, Paul Smith, Comme des Garçons, Nicole Farhi, Margret Howell and Katherine Hamnett. When, presumably they were approached to produce garments based on their reputation for high standards as well as for their Britishness. 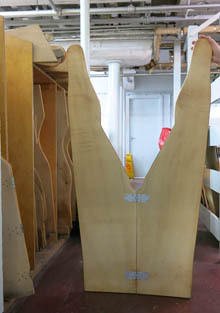 I felt pleased for Smedley’s that garment detail found in the archive was being fed back into modern designs. I know, I know, all this is beginning to sound like I heart Smedley’s, and maybe I do now. I was definitely impressed with this new-to-me world of garment quality staples. Looking through the decades and stories uncovered that Gran and I had gathered on our adventure together, it had become evident that the company and it’s ability to reinvent, however eccentric or progressive at the time, has held true to core values of brand quality. 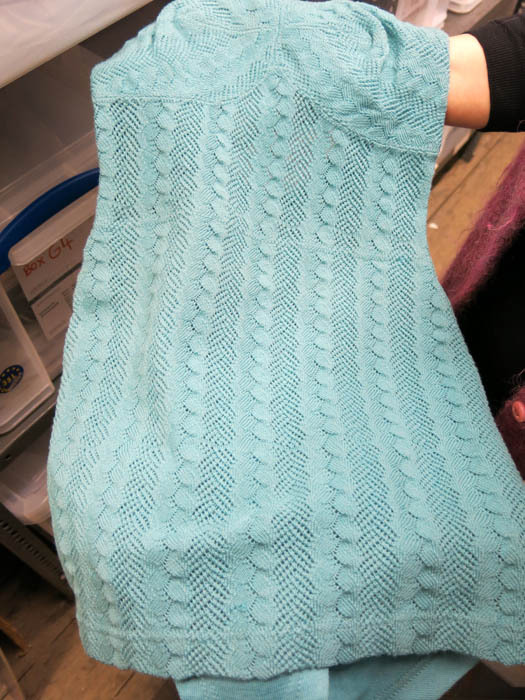 They’ve survived through the most challenging of business eras, becoming an example of high standard garment manufacture alive and knitting in Briton today. Yes, they have a high price tag to match but from now on I’m going to aim for less garments, but ones that last and make me feel like I’ve gained a lot more by feeling and appreciating the touch of soft unfelted wool and hopefully looking smarter at the same time. Gran and I celebrated this sentiment, and our time together with Jane, by spending the rest of it, along with our money, in the on site Factory Shop. Gran was instantly taken back by the vivid colours, in itself a noticeable progression from the garments we’d seen in the archive, she remarked “Oo, in my day, a man wouldn’t have been seen dead in pink or purple. Your Granddad once owned a pair of yellow socks but he got terribly embarrassed about it when we went to an auction and the auctioneer shouted, ‘Sold to the gentleman in the yellow socks!’, he was very shy about them after that.” We both agreed it would be great to see the Smedley’s archive being made public, so future generations can share their stories of machine knitted clothes, reminisce the characters who made or wore them and ask questions about garment manufacture’s development, passed to present.